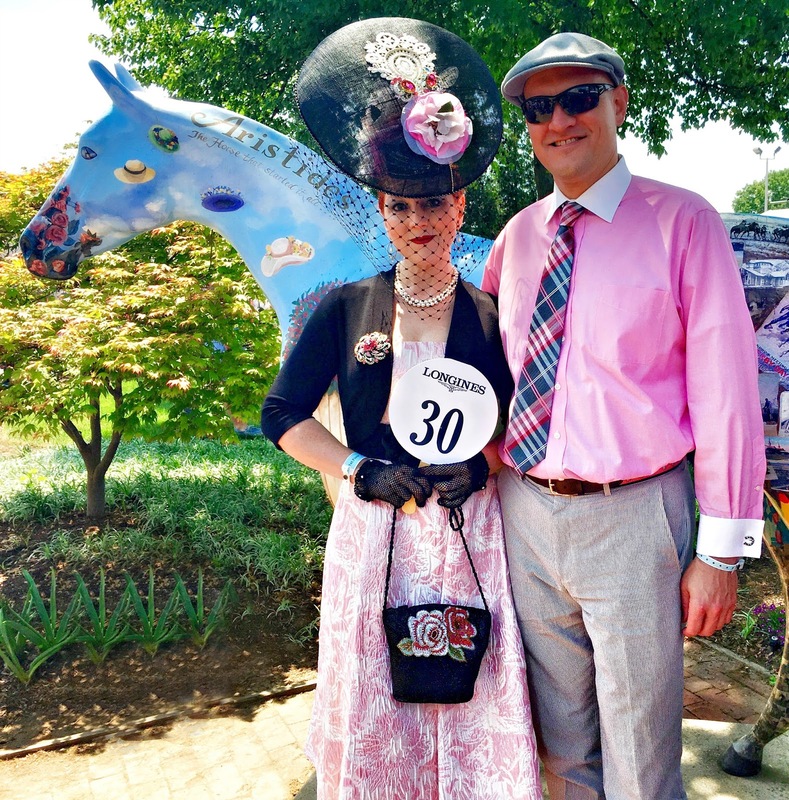 Last year, when I won the Longines Kentucky Oaks Fashion Contest at Churchill Downs, I didn't think I'd ever find a hat I loved more than the one I wore that day... I was wrong. This hat. This hat is enormous. This hat is unconventional. 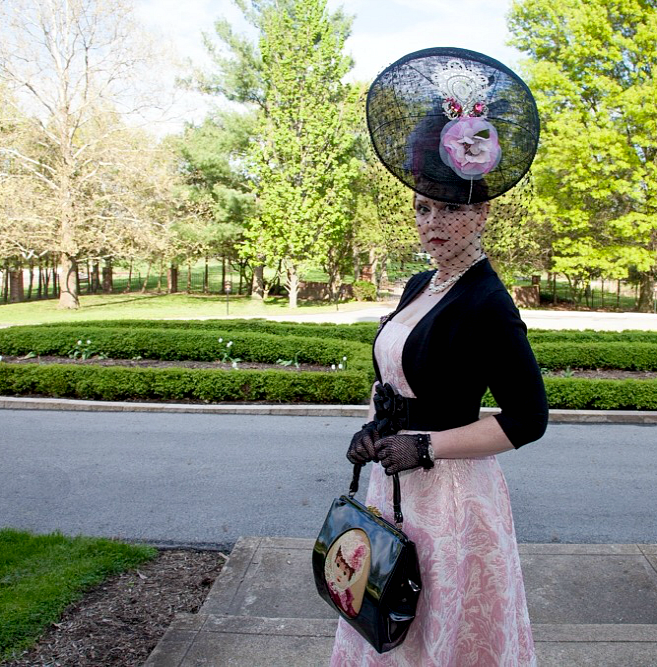 This hat was not what I had in mind for this year's Kentucky Oaks. It wasn't even a shade of pink I typically gravitate toward. ...and then, I tried it on. 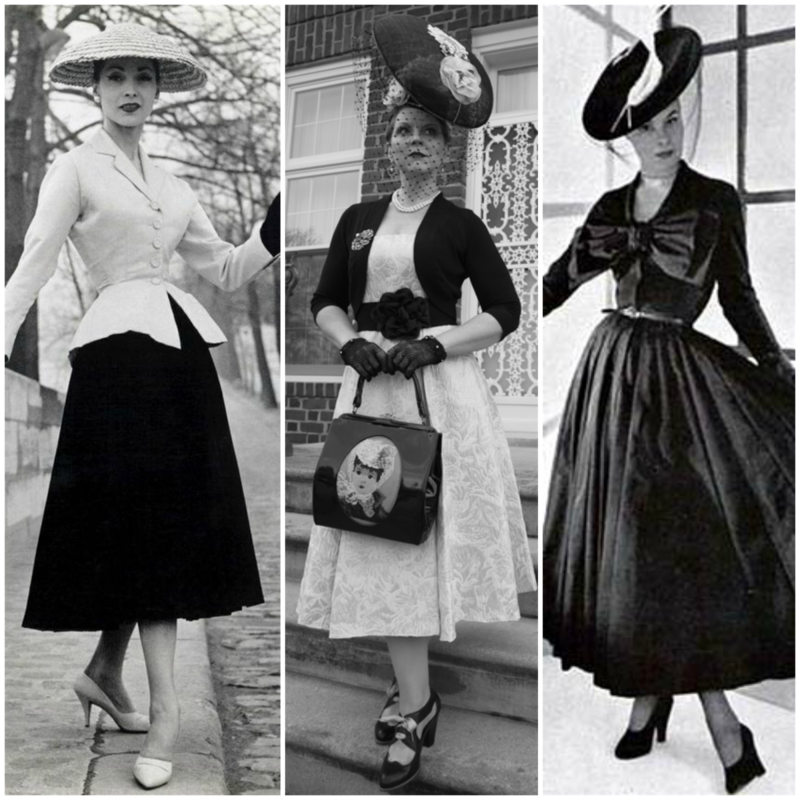 It's not everyone's cup of tea, and not everyone could wear it. It was perfect. 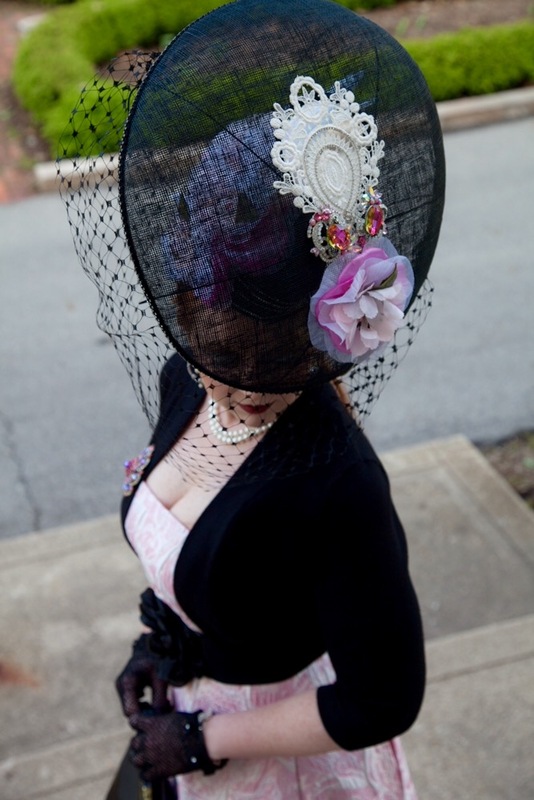 It was everything I never knew I was looking for in a Derby hat. It was meant for only me. After donning it, I'd have never been satisfied with another choice. I expect there are people who may find it a bit over the top (or even a lot over the top). Indeed, for most events, it would be too much. 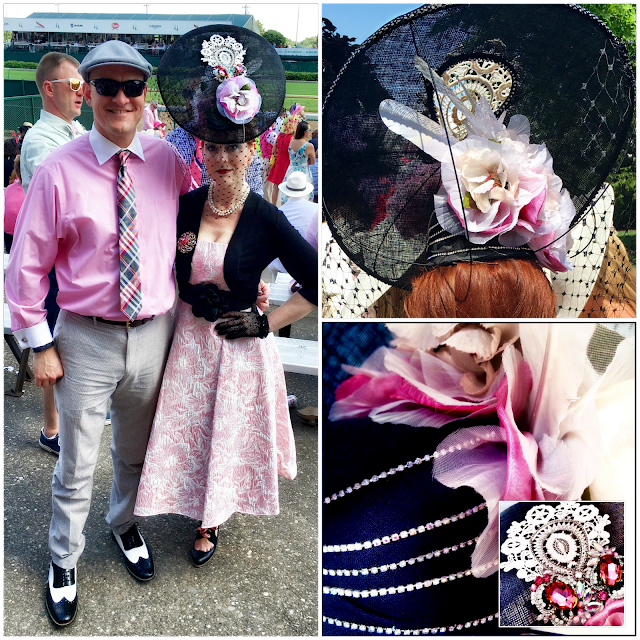 But for Churchill Downs on Derby weekend, it was everything. 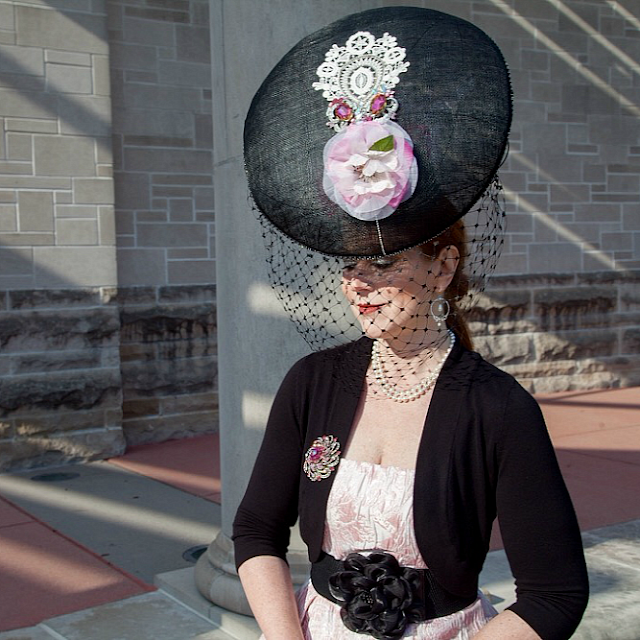 Not surprisingly, it was designed by Loreta Corsetti, the same milliner who created my pink champagne-themed topper last year. 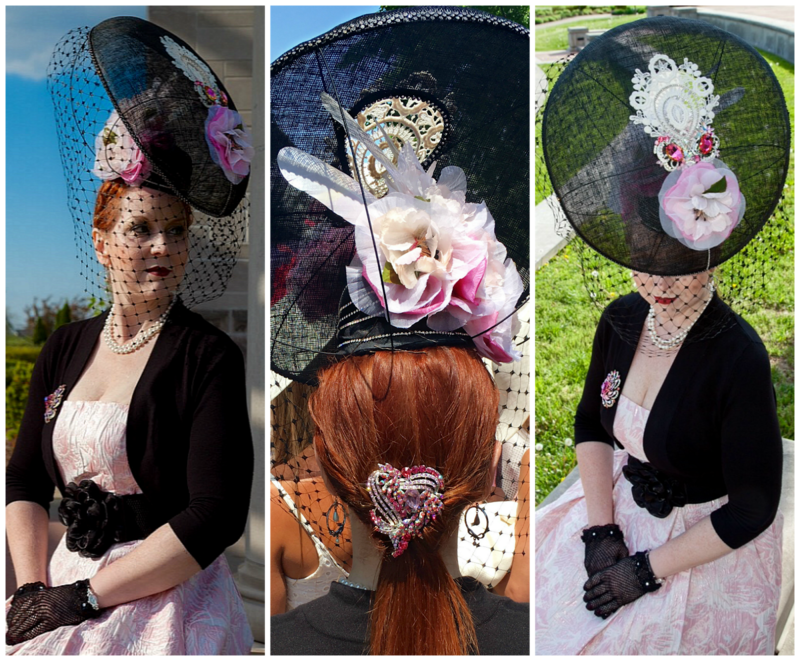 Trained in couture, Loreta creates all of her hats by hand, and all are one of kind works of art. This one features hundreds of hand sewn crystals that glitter from every angle - it's as interesting to look at from the back and sides as it is from the front. This is important at the racetrack, where so much time is spent looking at the back of people's heads from the grandstands. 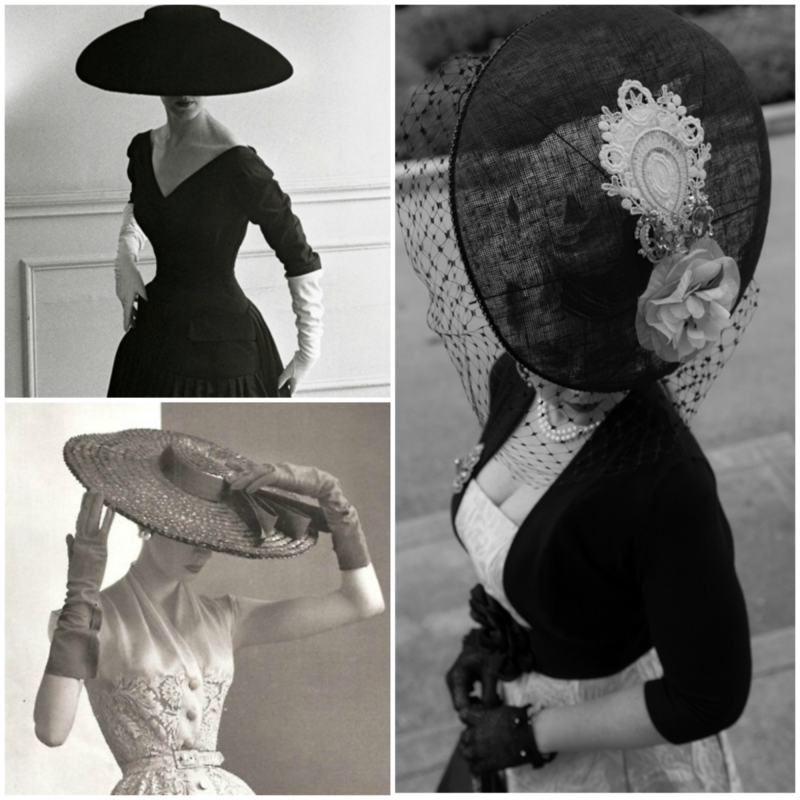 The silhouette, though displaying a gravity-defying modernity and elaborate details, reminded me of the wide brimmed toppers Christian Dior sent down the runway to accompany his New Look in 1947. Loreta Corsetti's design (right, image by Faith Blackwell Photography), though more elaborate and angled differently, reminded me of Christian Dior's iconic "New Look" first introduced in 1947 (images on left). As such, Dior's iconic designs were the inspiration for the rest of my ensemble, as well. 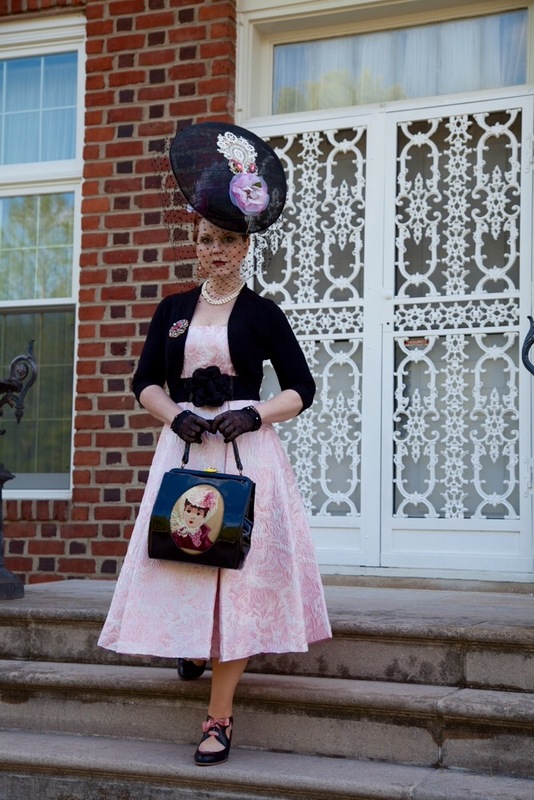 The pale pink jacquard dress is new this season from Nordstrom, but with classic pearls, a vintage handbag, and crochet lace gloves, it definitely recalled my favorite fashion era. KDef was a gamer for the fashion parade, too, donning grey seersucker; spectators; a newsboy cap; and horseshoe cufflinks to complete his Oaks day "Pink Out" look. 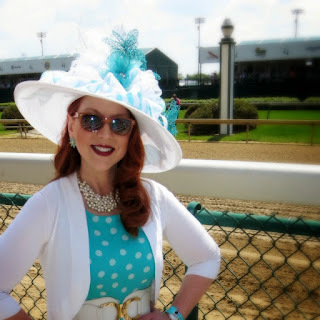 Oaks day was 73 degrees and sunny all day. Perfect weather for a day at the races! 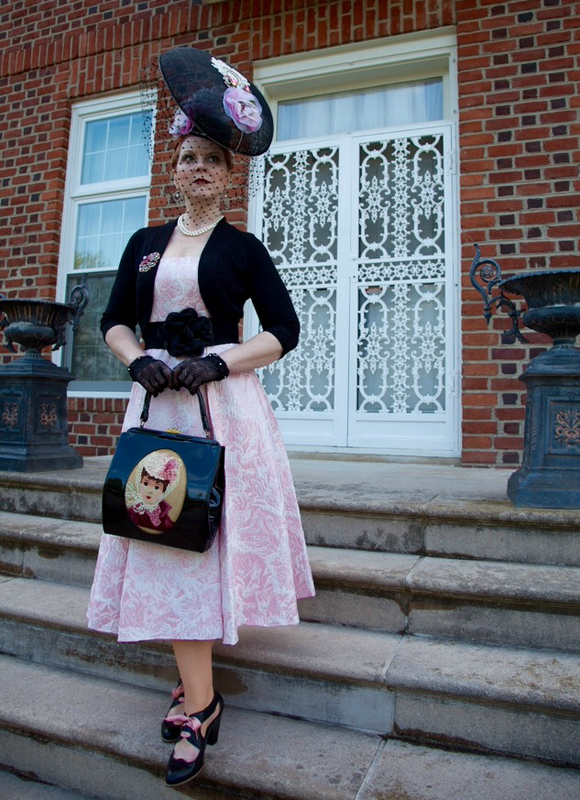 Perfect hat and "New Look" aside, Oaks day was a winner in every respect, even if I didn't pick the first place filly. Great weather; gorgeous horses; fun fashion; new friends; and a mint julep (or two) make for one fabulous Friday at the races! Jody, what a fabulous look. The hat is the bomb. Glad you had nice weather too. Thank you!! I've loved following your European adventure! 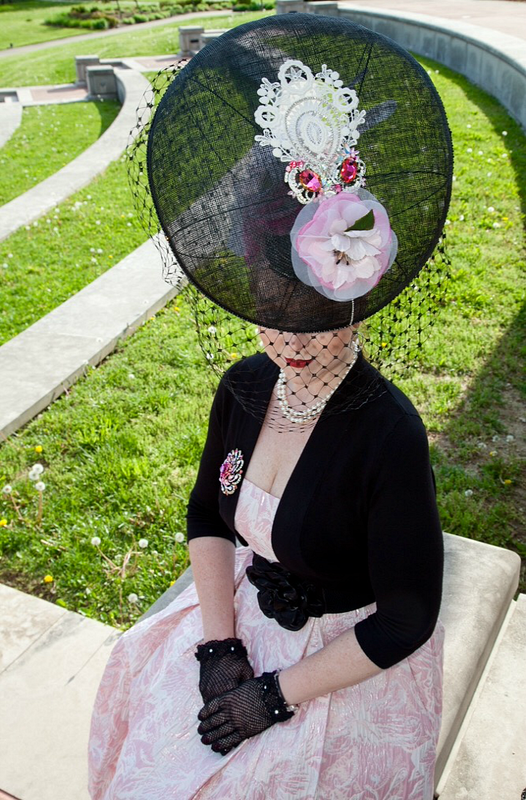 I think that is the perfect Derby hat-it has to make a statement! Wow! That is a seriously wonderful statement hat! You both look fantastic! I must compliment your date on his shoes. Very spiffy! 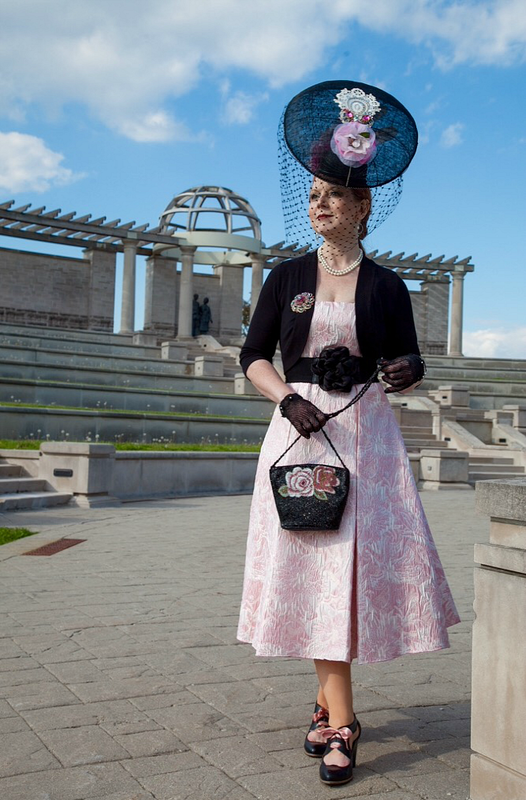 Your hat is divinely amazing! I am honored that your shared its magnificence with Hat Attack!